It is a sheer myth that the word ‘boss’ has a negative connotation or that he has the divine right to treat his team as personal property. The truth is otherwise. The edited book provides vivid glimpse of real stories of industry czars, journalists, bureaucrats who had illustrious innings as bosses. The versatile editor has extracted innumerable ideas from their perspectives and has knitted these in a way that makes the reader curious about what lies ahead. Bosses can be visionaries, strategists, inspiring, terrific, hot headed or terrible and the book introduces the readers to all of them. Sometimes referred to as a warrior, a good boss is a great influencer and helps navigate a long journey to success. He follows think-out-of-box strategy. He believes that it is better to have commonsense without education than education without commonsense. He connects with his team and judges his team members accurately. He ensures that nothing improves unless measured (RFD mandate). He creates healthy culture as trust deficit reduces efficiency to almost half. Qualities of a boss thus boil down to intellectual honesty, experiential learning, compassion, commitment, punctuality, self discipline and diplomacy. Managing people is rocket science as no two people are alike. Although, pendulum swings between good and bad bosses, studies galore that the latter makes stress levels trigger, causing heart attacks. Boss with a bossy attitude acts like a catalyst for mass exodus, takes erratic decisions, destroys inspiration, bulldozes others’ views and are vindictive. He is arrogant, abrupt, conceit, self centered, and unaccommodating. He resorts to fault finding, expects subordinates to behave like chamchas, , poses busy and is spineless being unable to protect team. He leaves his subordinates with no option but to quit a nasty boss instead of quitting a job. A wonderful boss on the other hand evokes admiration and respect. When subordinates respect him, they obey. But when they love him, they follow him. He acts like a coach, counselor, and confidant. He knows when to act as a commander or a general. As a strategist, he explores new ventures. A firm believer in walking the talk, looking beyond quality, he uses philosophy to turnout as mentor. He has passion for humour, sensitivity, empathy, humility, building relations and energy to break rules for excellence. As a result, subordinates start producing better results. An interesting part of the book is Boss Quotient Test to appraise one’s rating. 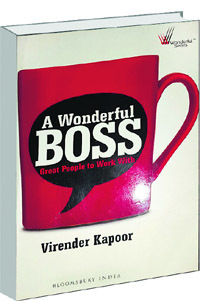 Overall, author deserves compliments for bringing an interesting, thought-provoking and path-breaking boss guide for all those who work selflessly, resolutely and relentlessly with transparency, trust and integrity, for the well being of team members.